We still have another week to go before Jeff heads back to work (and you would hear plenty of groaning about that if you were here! ), so there won't be a Wednesday Treat Day until then. But, I do have something special to share with you that I made for us instead! Playing off the idea of those Oreo truffles that Jeff is so keen on, I made and baked a batch of dough from one of his favorite crispy and thin chocolate chip cookies to make these Chocolate Chip Cookie Truffles! This was the recipe we used for the cookie dough, but I think you'd be fine using whatever recipe you like - just bake the cookies until they reach a rich golden brown color, but have not burned. 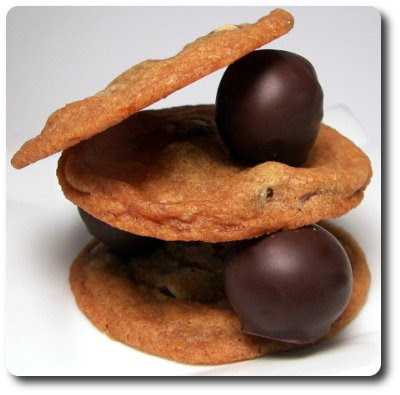 Do note, that recipe will make more dough than you need - we reserved the raw pounds' worth needed for these truffles, then scooped out the remaining dough into balls and froze them to bake off as needed for warm cookies! Once I had baked the cookies and they had cooled completely, I broke them up and put them in the food processor. Jeff didn't know my plans, so I wish you could have seen the horror on his face as he watched his precious cookies slamming against the processor bowl, turning into tiny crumbles. I assured him it would be worth it in the end, but I don't think he was convinced - he then left the kitchen, with a single cookie I left behind for him in hand, shaking his head like I went completely bonkers! Hee hee! To the bowl full of tasty, but now pureed cookies, we added just enough softened cream cheese to hold those tiny pieces together. The mixture should be slightly moist, but not sticky or wet - I was able to shape it right away into balls, but if it seems too messy for you, cover and toss it into the refrigerator to firm up for a bit. While I could have been content popping these little spheres into my mouth as is, dunking them in a pool of melted bittersweet chocolate was just the ticket for taking them over the top. 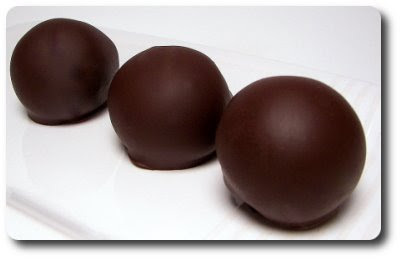 We used a hunk from a solid bar of good-quality chocolate for dipping, but you could use those chocolate disks or candy coating if you have trouble melting chocolate. If you use chips, you might want to add a little shortening to help thin it out. Since our block of chocolate was already in temper and we would be storing these in the refrigerator anyway, we did a quick, but not necessarily "proper" tempering process. This was done simply by heating three-quarters of the chocolate needed until it was almost completely melted, then stirring in the remaining chopped pieces to cool it back down before dipping. With its snappy chocolate shell, the firm center was like an amplified chocolate chip cookie, except wrapped up in a pretty little bite-sized package. While the center didn't have that melt-in-your-mouth quality like you would find in a true truffle, it wasn't grainy or coarse as you might expect a bunch of ground up cookies to be like. Fun, a little unique and definitely addicting, Jeff has already proclaimed these a "must make" for next year's Christmas baking spree! If you took a peek into one of our freezers (don't ask how many we have...! 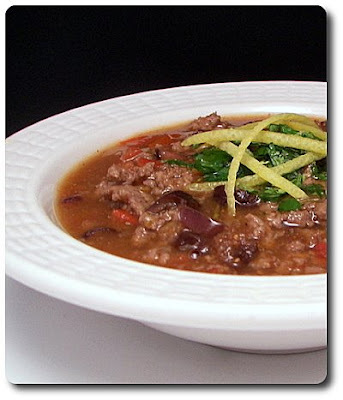 ), one ingredient you will typically find is lean ground sirloin. Useful in a variety of dishes, it browns in a snap and makes for speedy weeknight meals, just like these individual Italian Pot Pies we made for dinner. To place underneath a homemade biscuit topping, a mixture of onions, carrots and garlic was softened in just a touch of olive oil. While the original recipe didn't call for fresh garlic, I thought it would be an appropriate addition, especially given the recipe name... so we tossed a couple minced cloves in. We tossed the sirloin in and let the crumbles gain a bit of color before adding a couple cups of homemade marinara sauce that we also had stashed away in the freezer. Jarred sauce would certainly be fine, but just be sure to use a favorite that has plenty of flavor coursing through. After giving the beefy mixture a few minutes to bubble and thicken, we divided the saucy concoction between four ramekins. If you don't have any of those handy ramekins, you could use a smaller casserole dish or even a larger loaf pan, if needed. With a few strokes of a sturdy wooden spoon, we prepared the rosemary-scented biscuit dough to scoop on top to cap these individual pot pies off. Rosemary wasn't the only ingredient flavoring these biscuits; we also tossed in a grating of fresh Parmesan cheese for a sharp note. While the filling is completely cooked, you'll need to bake these ramekins long enough to lift the biscuit dough to a light golden brown. 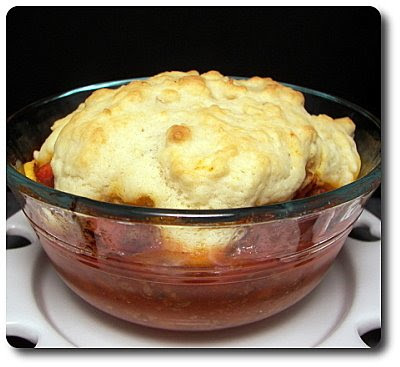 Quite hearty, these pot pies were homey, comforting and didn't take too long to throw together! If the biscuit topping doesn't strike your fancy, how 'bout whipping up a batch of mashed potatoes (using the same rosemary and Parmesan additions!) and piping or dolloping them on instead to twist this more towards being a shepherd's pie? Remember how I told you my sister and brother-in-law came up for a visit last weekend and we did some cookin' in the kitchen together? Well, I put them (and Jeff!) to work so we could knock out these Chipotle Beef Tamales for dinner that Saturday night! While there really isn't anything difficult in the preparation, it would be pretty tedious to fill all those corn husks all by yourself! Before I asked them to come help me, I first got the dough together that we would be working with. If one was going to be fairly traditional with making masa dough for tamales, there would probably be a good amount of lard used. However, the recipe we made used a couple unique approaches to add in extra flavor, without the need for so much fat. The first layer came from steeping a couple smoky ancho chiles in hot chicken broth until they had softened and were pliable. Those two went into a blender, along with a couple handfuls from those summer corn kernels we stashed away in the freezer this year, to be pureed smooth. That concoction was then added to a mixture of masa harina, salt and baking powder with the required lard being cut in with a pastry blender. We only needed to use four chilled tablespoons worth though - I think that's pretty negligible considering we'd be making 24 individual tamales! You can prepare this dough up to 2 or so days ahead of time - just wrap well and keep it in the refrigerator until needed. 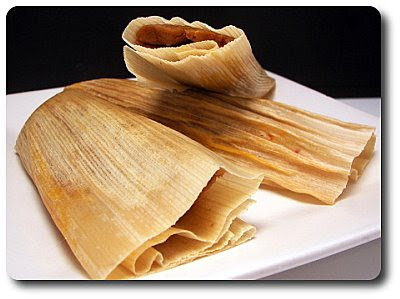 While we weren't going the veggie route with these tamales, if you wanted to change out the filling and needed the dough to be vegetarian-friendly as well, swap out the chicken broth for vegetable and use either canola oil or vegetable shortening for the lard. That moist dough I made will then be used to encase the beefy filling - a simple combination of softened onions, pungent cloves of garlic, oregano and browned beef that we sauced up with a can of chipotle sauce for a mild, but decidedly smoky heat. The assembly process should be fairly straight forward in our recipe, but if you have any questions, don't hesitate to ask. The two suggestions I'd offer is to have an? (few!) extra hands available and soak the corn husks for as long as you can - I like to leave them be for at least an hour or two so they stay pretty flexible. Cooking the tamales is a snap - you just need to steam them until the masa has firmed up enough that it will easily peel away from the corn wrapper... this usually takes around an hour. Be sure to keep a wandering eye on the level of water in the bottom of the saucepan - you do not want it to go dry! Waiting that hour was probably the hardest part as the house filled with the sweet scent of corn tortillas as they steamed away. Perfect to make ahead of time and freeze, the full recipe will give you about 12 servings of two tamales each. If you have leftovers, just wrap them in a damp paper towel before reheating so they won't dry out. 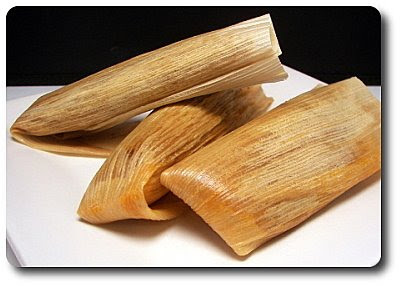 Can you still make a tasty tamale that is a bit lighter in the fat department without them being a disaster? You certainly can and we all agreed that these hit the spot! Adding those additional notes to the masa dough made a big difference - so, while they may not be AS rich as a traditional tamale, that can sometimes be a good thing! I didn't think about it until afterwards, but it would have been nice if one of us kept our fingers clean to take pictures of our tamale assembly line! 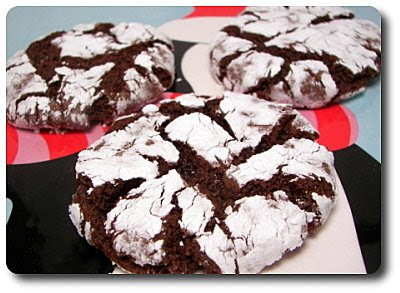 Since we were going to be staying home this past Christmas eve, I threw together a batch of dough to make these Espresso Crinkles on Christmas day. We didn't really need cookies since we did just make those Iced Oatmeal Applesauce Cookies last Tuesday, but they didn't really fit in with the holiday theme and besides, one can never have enough cookies! The dough for these cookies took just a couple minutes to throw together - no planning ahead for softened butter either, as they use just a couple tablespoons of canola oil instead. I used Dutch-process cocoa powder mainly because that is what I primarily have in the pantry - it has a smooth, rich chocolate flavor. However, natural cocoa powder would also work well - it has a slightly bitter edge, but can also be described as having a more rounded note. Instant espresso powder is used in the dough, however there isn't enough called for to give the cookies a prominent coffee essence. What it does is dance with the cocoa powder to intensify the chocolate flavor - however, you could bump up the amount by a half teaspoon or so if you wanted the cookies to exude a bit more coffee bite. While the original recipe called for light corn syrup, I swapped that out for Lyle's Golden Syrup to give the cookies a mild caramel/burnt sugar background. The dough, once combined, will need to be well wrapped and left to hang out in the refrigerator for at least a couple hours or overnight. Rolled into balls and dragged through a bowl of powdery confectioners' sugar to give them a snowy coating, the cookies are baked until spread out and the tops bust, leaving behind craggly crevices. Take these cookies out just before they are completely set - if you feel like you need to check, a toothpick placed in the center should have some sticky crumbs attached when pulled out. Be sure to let these cookies cool for at least 2 minutes (and maybe a couple extra, as needed) on the baking sheets - right out of the oven they are fairly soft, but they will firm up as they cool so you can move them to a wire rack. Chewy through and through, sinking our teeth into these cracked rounds was like taking a bite from a rich brownie, just thinner! I stuck a couple of the cooled ones into a bag and stashed them into the freezer - when I went to take them out to thaw this morning, they looked and ended up tasting just as good as when we made them on Thursday! A tiny bit of the sugar coating on the outside faded away as they came to room temperature, but Jeff didn't even notice when I asked about it. So, I think these would definitely be a good candidate to be made ahead of time! Along with herds of others today, Jeff and I went out to a few stores to see if there was anything to find during the after Christmas sales. Other than dodging the array of people, we didn't find too much... however, I did score a few boxes of parchment paper for a whole $0.99 each! Woo! So, while the trip out wasn't too exciting, at least we would be coming back to a Friday Night Pizza! This was not our typical savory pizza we would have for dinner though... nope, this time we made an Apple Cinnamon Pizza for dessert (well, and to snack on before dinner!). I didn't stray from our regular whole-wheat pizza dough for this sweet treat - once stretched out, we gave the dough a quick pre-bake since the original recipe called for a "twelve inch pizza base". 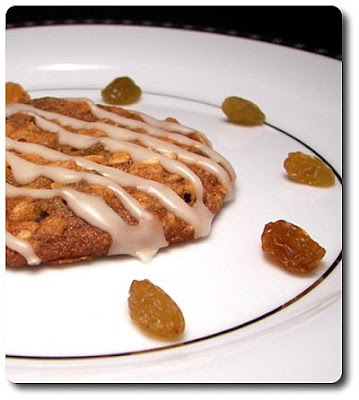 Over the lightly baked crust, we tossed on top plump golden raisins - if you don't have any raisins, dried cranberries would be a suitable replacement. To hide those sweet gems and keep them from burning, we added an apple mixture composed of diced apples, granulated sugar, melted butter, fresh lemon juice and a healthy dose of our favorite Vietnamese cinnamon. Spread the apples close to the edge, but do leave a bit of a lip around - as the apples cook, their juices will begin to release, merge with the butter and begin to caramelize with those sugar crystals. That lip will be a barrier from those juices leaking and cementing to your oven floor! 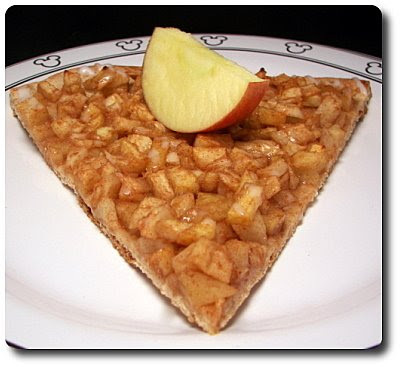 Let the pizza bake until the crust is golden and those bits of apples are pleasantly soft, but not too mushy. Jeff thought a confectioners' sugar drizzle would be nice to spruce up the top, but we added it when the pizza was still warm, so while it melted right into the apples, you can still see a bit around the edge of the crust. Did it need that extra dose of sweetness? That is debatable, but it was a nice touch - just whisk up a quarter cup to half cup confectioners' sugar with enough milk to thin it to a drizzleable consistency. 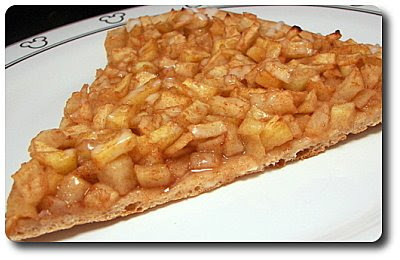 The texture was a nice contrast between the soft apples and the crackly thin and crisp crust - while the lemon juice adds a bright background, it also helps keep the apples from darkening too much if you want to prepare the apple mixture a little early. If you're a nut fan, toasted walnuts would be a nice way to finish this off. As is, this nutritional stats are pretty good on this - however... a little naughtiness is always good, so I'd certainly wouldn't turn away a piece that had a few lines of melted chocolate on top. Or... leaning heavily to the evil side, why not heat up some Nutella or peanut butter to pour on top for a decadent dessert! Jeff and I wish that everyone has a safe, happy and joyous holiday - enjoy those precious moments with friends, loved ones or anyone that is special to you! We'll be spending a quite night at home with the pups - as tradition goes, we'll be packing everyone in the car to go drive around in a little bit and gander at all of the lights and holiday displays around our area. 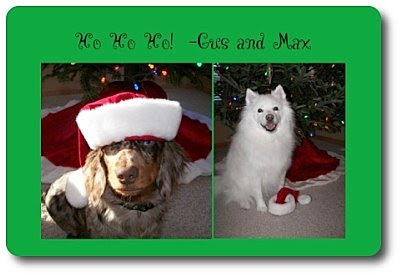 Gus and Max are anxious to share their Christmas tree photographs this year - Gus didn't care much for the Santa hat, but he put up with it a lot longer than Max did! Max was much happier with the little hat on the floor next to him, rather than atop his fluffy head. If we don't have a post tomorrow, we'll be back to our regular schedule on Friday! As usual, Jeff took the last two weeks of the year off - so, the next Wednesday Treat Day will have to wait until the new year! However, I still have a sweet treat I can share with you! Even though we just got done making a bunch of baked goods, most of them left the house and we only had a random few leftover. To restock our supply, a batch of these homey Iced Oatmeal Applesauce Cookies was in order today! Chock full of old-fashioned rolled oats, these thin oatmeal cookies really hit the spot. 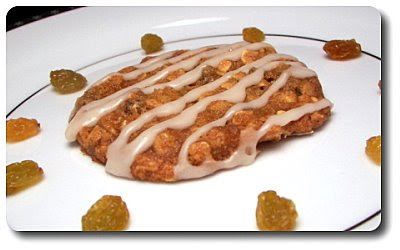 A little on the lighter side by using only four tablespoons of butter in the dough, the cookies are not lacking in flavor thanks to the addition of fragrant cinnamon, rich brown sugar, and plump golden raisins. 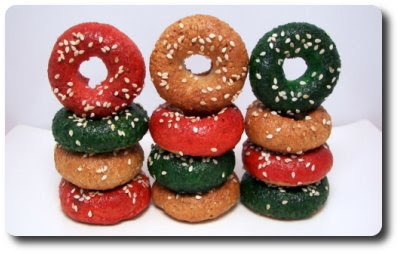 While there is a touch of crispness around the edges, these are decidedly chewy, bendable and moist from using a half cup of applesauce. Right from the oven, the cookies will be fairly soft and delicate - give them at least 5 solid minutes, sitting on the baking sheet, to give them time to firm up before transferring them to a wire rack. Letting them cool down on the warm sheet also attributes to their chewy quality! To spruce up the tops and add a maple note, the cookies are drizzled with an icing made from confectioners' sugar, sticky pure maple syrup and just enough water to get a flowing consistency. While on the sweet side, the maple icing compliments the warm flavors the cookies contain, yet doesn't overpower their subtle nature. It is also the type of icing that sets up well, which would make them a choice candidate to wrap up and sell during those autumn bake sales! I really need to plan more soups into our menus... it seems that weather we normally see in February has come a bit early and it has been quite chilly around here lately! 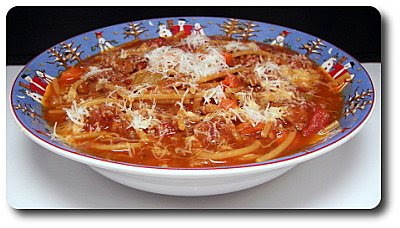 In an effort to kick that idea into gear, I decided on this Meaty Spaghetti Soup to have for dinner tonight! 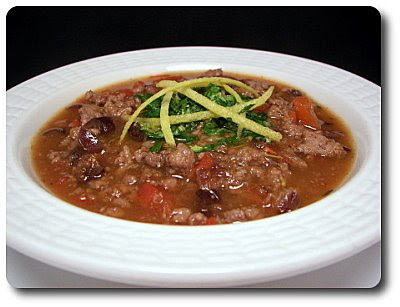 With flavors reminiscent of spaghetti and meatballs, we began this soup by browning a pound of lean ground sirloin, then bulking the mixture up with chopped onion, celery and carrots. To round out the flavor, a mess of minced garlic is added, along with oregano and a couple shakes of cayenne pepper sauce. As soon as the onion had time to soften, we stirred in a few tablespoons of thick, concentrated tomato paste. We've mentioned this before, but I think this is an important point - when you add tomato paste, be sure to stir it in before any liquids, so the paste has contact with the bottom of the pan. This gives the paste a chance to develop a rich character that it might not get otherwise. 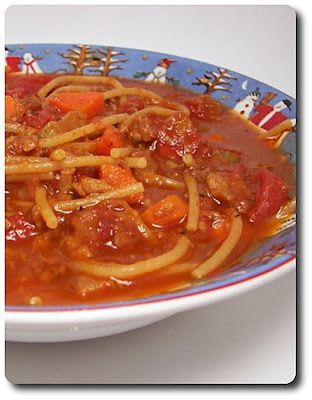 To continue the soup, we added fire-roasted diced tomatoes, beef broth, a cupful of water, a splash of vinegar for an acidic balance to the sweeter tomatoes and a pinch of sugar. While you are not really looking to bring additional sweetness to the soup with the sugar, it tends to help remove any "tinny" flavors that might linger from the can. Once the soup was given a chance to simmer for awhile, allowing the flavors to marry and the vegetables to become tender, broken pieces of thin pasta are added and the pot is removed from the heat to finish cooking the pasta through. There was enough residual heat left in the pot to cook the pasta to the perfect degree - we used the bits and pieces we've been saving from our boxes of whole-wheat spaghetti, but use whatever small or thin pasta you like. Just take a taste to make sure the pasta is ready before serving. Once served, a fresh grating from our block of Parmesan cheese in each bowl was the last needed touch. Liquid-y enough to not be mistaken as a loose bowl of spaghetti, but still thick enough to have body and texture, this fantastic hearty bowl of soup warmed us up from the inside out! Jen and Steve (my sister and brother-in-law) came up to visit us this weekend. We had a nice time, made a few new recipes (more on those later) and just kind of bummed around the house since we had a nasty snow storm. 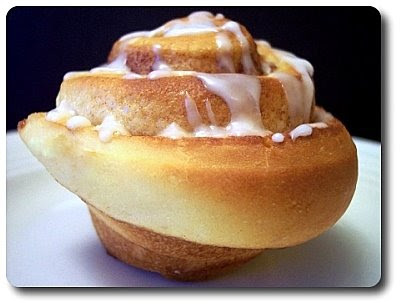 For a surprise sweet treat this morning, I threw together a batch of those Sour Cream Buns that we've made a few times now in the past - a bit different from your ordinary roll, thanks to the tang from the sour cream, but so tender and fluffy! I made sure to get the batch in the oven just before they got up... this way, we let the glorious scent of cinnamon dance its way up the stairs, wiggle under their door and slide right into their nose - what a way to wake up! We had about a half bag of red potatoes that had been in the pantry for awhile and I finally picked what I was going to do with them. While plain 'ol roasted potatoes are always enjoyable, this dish of New Potatoes with Roasted Garlic Vinaigrette sounded too good to pass up. To the quartered red potatoes we had, we added a mess of whole (unpeeled as well) cloves of garlic and tossed them with olive oil, salt and fresh ground black pepper. Be sure to leave those peels on the cloves - they will help keep the cloves moist and prevent them from drying out while they roast. While the recipe has you leave those cloves in the entire hour and ten minutes it took for the potatoes to cook, when I tossed the potatoes at the halfway point, the garlic was almost done. 10 minutes later and I took them out as they were plenty soft - if they stayed in much longer, I have a feeling they would have burned! 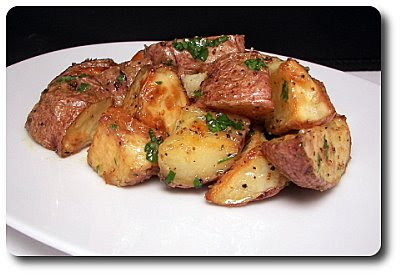 When the potatoes were done, we smashed the garlic pulp and prepared the coating for this dish by whisking that mellow paste with olive oil, fresh parsley, white wine vinegar and a dollop of Dijon mustard for tang and to emulsify the creamy dressing. 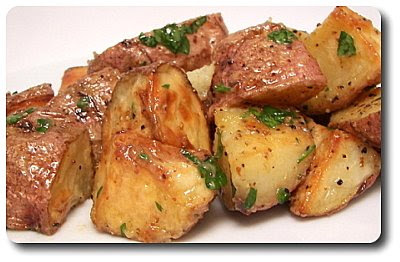 The wedges of potatoes were tender and moist with a delicious caramelized finish from the heat of the oven... and tossed with the sweet garlic dressing? This is what we call a winner! It was "supposed" to serve 8, but as much as we love potatoes, we were lucky to stretch this out to 6. In fact, we both found ourselves going back for just "one more piece"! 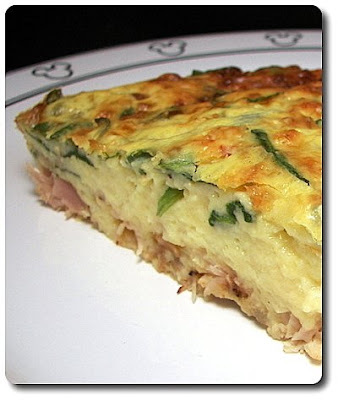 To go along with those potatoes, I also prepared this Crustless Turkey and Spinach Quiche. While this dish originally called for smoked turkey ham, I figured this would be a good chance to finish up the last of our leftover turkey from Thanksgiving I had stashed in the freezer. 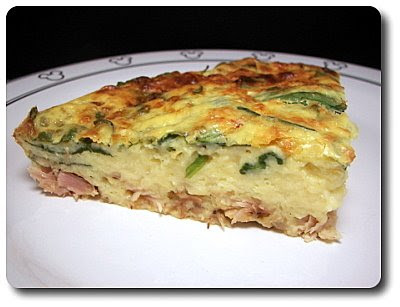 The base of this quiche is softened onions that we added shredded turkey meat (I used a half cup of both dark and light meat) to and let get a little color in the skillet. Before we started piling the onion and turkey mixture into our pie plate, we first scattered shredded Swiss cheese over the bottom for a cheesy layer underneath. To create the filling we poured on top, a combination of evaporated milk, eggs and egg whites, cottage cheese (! more on this in a bit), additional swiss cheese and sharp white cheddar were whisked together. To give this a bit of strength to hold together and a little extra help to keep it light in texture, a little flour and a small spoonful of baking powder is whisked into the egg mixture before being poured over the turkey. To check for doneness, you can slide a thin knife into the center of the quiche and it should come out pretty clean - you do want the center to still be a little soft and moist as it will continue to cook a bit while it is resting. If it looks like there is still a fair amount of wet egg there when you pull the knife out, let it continue to cook for a few minutes. 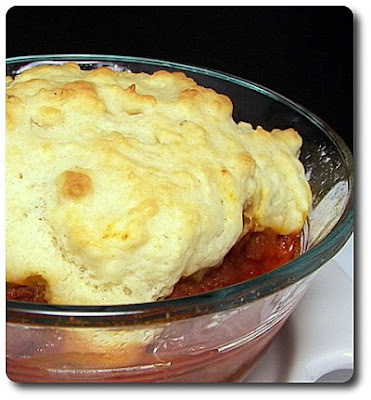 While it is fairly light since there isn't a crust, that doesn't mean it lacked flavor! 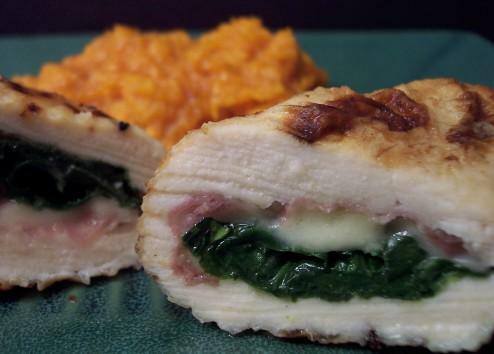 The combo of dark and light turkey added a nice punch, while the mix of cheeses brought a welcomed dimension to the not too-eggy filling. I did have to wait until Jeff was almost done eating to let him know there was cottage cheese in it... hee hee! I slyly sneaked some into the cart when we went to the market and thankfully he didn't see it - otherwise, I would have had to deal with him watching me with an eagle eye every time I was in the kitchen to see what I was going to put it into. He always "says" he doesn't like it, but its another ingredient he gobbles up and doesn't even know it! Oh well, you do what you got to do sometimes, even if it is a little evil! A couple weeks ago, we had picked up some fresh cranberries on sale at the market and decided on a whim to make this Cranberry Upside-Down Cake for Jeff to bring in and share with his co-workers. Before I started working on the cake batter, we generously coated a pan with softened butter, seasoned the pan with granulated sugar and arranged a couple cupfuls of bouncy cranberries on top. Don't be stingy with the butter here - two tablespoons will seem like too much, but it is not just used for release of the cake. As it bakes, the butter will melt down with the sugar to help create a shiny and sweet, yet still tart, ruby sauce on top. While there is nothing unusual about the preparation of the batter for this festive cake, it is given a bright boost thanks to the addition of tiny shreds of zest from a fresh lime. No limes around? Lemon would be fine as well - you're just looking to add an lingering note to give the cake some dimension. 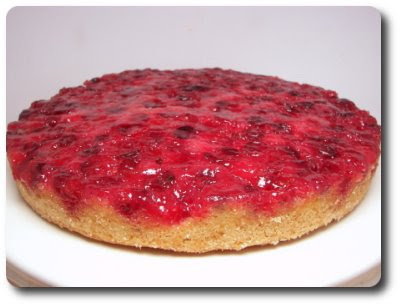 Once dolloped on top of the cranberry layer, the cake is baked until it has risen and taken on a gratifying golden hue - the toothpick test should come back with a few moist crumbs attached. When done, you'll want to let the cake cool for just ten minutes and then you need to flip it out - you want to do this while the sauce underneath the cake is still warm so it will release. While the cake slipped right out for us, if you did have a piece or two that got left behind on the bottom of the pan, there is enough sauce that you could patch them back on, if needed. I sent the cake in whole, so I didn't get a chance to taste it before everyone else, but Jeff stashed a small chunk for me to try when he got home - so good! 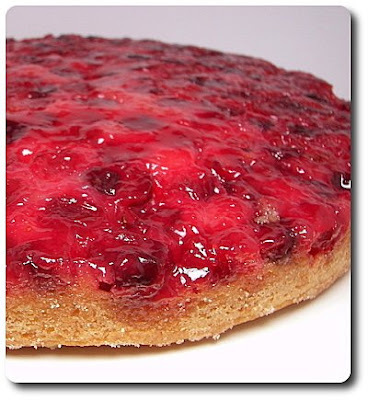 I liked how the cake was sweet and moist, with that subtle hint of lime coursing through, but what really set this off was that sticky cranberry topping with its tart attitude. Next time, I think a soft dollop of fresh, lightly sweetened whipped cream, spiked with a little more zest perhaps, would be an appropriate way to finish this off with a bang! Does anyone else do, or have you started, your own Friday Night Pizza yet? I'm glad we began doing this a few months ago... while it helps to know what you are going to have at the beginning of each weekend, it is fun to pick and choose what topping we are going to do! 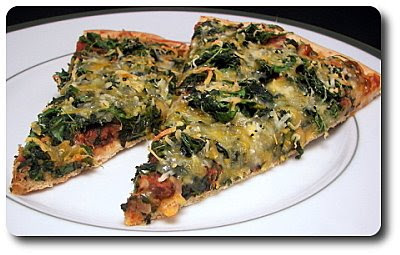 For this week's pizza, we decided this Mexican Black Bean and Spinach Pizza was going to be on tap. I hope you've given the whole-wheat pizza dough we have been using a try - it is so simple and such a pleasant dough to work with. We buzzed it together again tonight - when it had rested and rose a bit, I easily stretched it out to a rough circle to start this pizza. Because we wanted the crust to be on the crisper side, we gave it a pre-bake before topping. Rather than a tomato-y sauce, we spread our crust with a mixture of coarsely mashed black beans, onions, garlic, cumin and chili powder. I softened the onions first since Jeff isn't a fan of them crunchy, but you could skip that step if their texture doesn't matter to you. On top of that went spoonfuls of salsa (extra hot for us! ), followed by spinach and chopped fresh cilantro. A drizzle of cayenne pepper sauce and a blend of cheeses were scattered on top before the crust was slid back onto the stone to finish cooking through. This hefty pizza was decidedly filling, thanks to the beans and spinach - pre-baking the thin crust ensured the bottom would hold up against the toppings, but if you would like a bit more chew, up the dough recipe to the full pound version. I would definitely suggest using a very flavorful salsa that is at least around medium heat - due to the beans and spinach, anything less and I'm afraid the salsa layer would just fade away! I know we've slowed down a bit on posting dinners here, but I had been trying to keep it simple and quick (with a few repeats thrown in), so I could concentrate on getting the baking done for the holiday gift boxes. 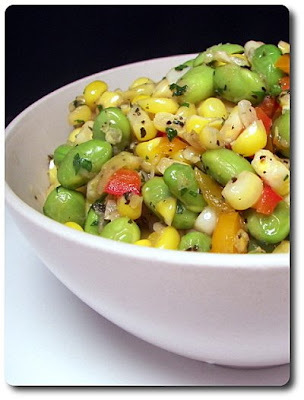 For example, I did make this new recipe for a side a couple nights ago, Herbed Corn and Edamame Succotash, but I just served it with grilled chicken and some fruit for dinner. Took just a few minutes and I was back in the kitchen makin' a mess with flour, butter and sugar! Remember when I told you about that fresh sweet corn we stashed away in the freezer late in the summer? I snatched a couple cups worth out of the supply and added the kernels to a skillet full of softened red bell pepper, onion and garlic. 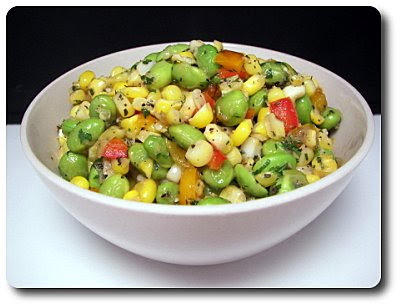 A couple shots of dry white wine and shelled edamame (green soybeans) were also added and given enough time in the skillet, with a few flash flips of the wrist to jostle them around, until the vegetables were thoroughly heated through. Freshened up with rice vinegar, parsley and chopped fresh basil, this speedy side was ready for our forks! While it is freezing cold with lots of snow on the ground outside (and more falling as we speak! ), taking a bite from this was like reliving the warm breezes of summer at the dinner table. Which, sadly, didn't last long enough for me since some happy puppy needed a trip outside. While we had it with slices of grilled chicken on top, I also see us enjoying this with some snazzy barbecued shrimp - unlike last night's dinner, I do see this dish coming back to our plates at least a few times in the future! The time has finally come - we've wrapped up our holiday packages for 2008 that we are sending out in the mail or delivering to the neighbors. I'm not sure how we actually got all this done in time, but whew, what a rush! Grab a drink, pull up a chair and check out what we made this year! 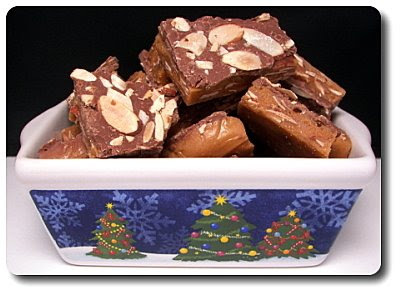 First up is the always irresistible Almond Roca - I made 15 pounds this year. This stuff is so hard to stay away from - buttery and crunchy with a sweet slick of melted milk chocolate and toasted almonds on top. One of our top favorites of all time. While we usually try to find those fun kissable candies to adorn these next treats, we couldn't find them at all this year! 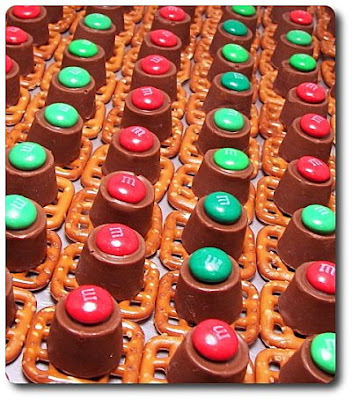 So, instead, on top of the salty pretzel weave and the rolo caramel candy, a holiday M&M fit the bill! No real recipe - just put the chocolate on the pretzel, slide a batch in a warm oven for a few minutes to soften the chocolate and slide your candy (or nut!) of choice on top! So easy! 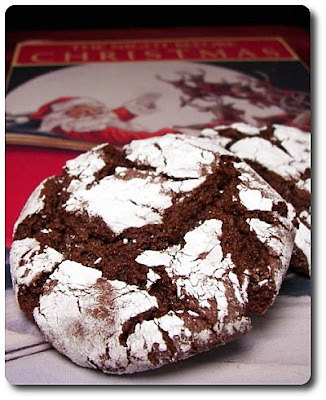 Next is Jeff's favorite cookie that is a requirement every holiday baking spree (and at several other times during the year!). You can use plain malted milk powder, but a dose of chocolate malted powder instead adds another sweet layer that takes these up a notch! 14 dozen of these! 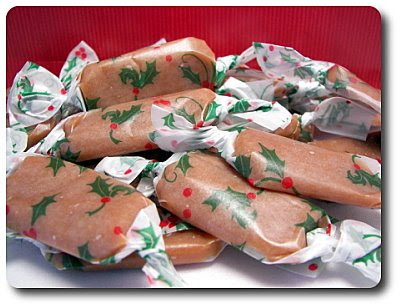 We probably should branch out in the fudge department, but this below is the first I always make each season. Such a creamy and intense cinnamon rush! We just made these cookies for a Wednesday Treat Day at Jeff's office a couple weeks ago and I knew after preparing them that they would fit right into our holiday baking spree. 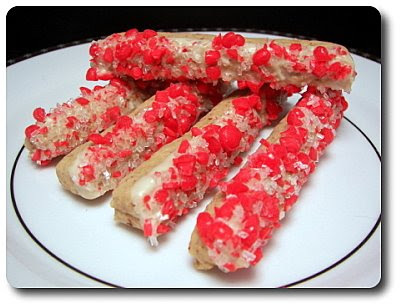 The red hots are a little unexpected, but when combined with the dip of white chocolate, the sparkly coarse sugar and nutty almond cookie, these sticks are sure to please no matter what age you are! We always make some sort of biscotti every year to send out... however, Jeff called me from work yesterday and told me that he thought we forgot to bake some! I ran over to the table full of treats waiting to be bagged up and guess what? No biscotti! Oops! 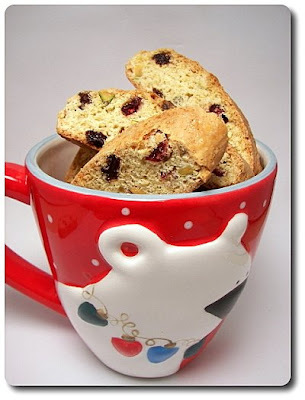 So, I got these done at the last minute - a solid recipe that yields golden biscotti that are crunchy, yet have a tenderness to them from a few pats of butter added to the dough. 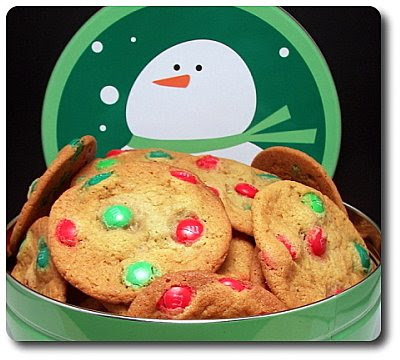 Besides, they fit with the theme with green pistachios and red cranberries! For the folks with pups at home, we decided on these treats again! We made them last year for our pets, but decided to spread them around! 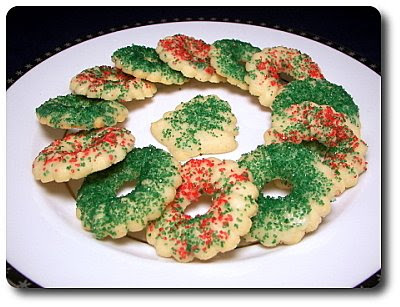 Here is a new recipe we added this year - these buttery cookies were a joy to prepare. While I was preparing the dough, the aroma charmed Jeff into the kitchen and asked "when did you go out and buy eggnog and how come I don't have some in a cup yet!?" While there is no eggnog used, it's flavor is brought in by using fresh grated nutmeg, rum extract and a dash of vanilla in the dough. Once the cookies were baked and still warm, we brushed them with a sweet frosting that we infused with a little more rum extract and sprinkled with colored sugars for a visual touch. *My tips on spritz cookies - I always use cold, ungreased or unlined, baking sheets and don't refrigerate the dough once combined. The soft cookies stick to the sheets while raw, but will glide right off after being baked due to the butter content. These caramels are dead easy to make and are so rich, soft and buttery - they don't necessarily taste like coffee, but those tiny espresso granules added bring an alluring quality that makes these extra special. The only tough part is staying out of them while you are trying to wrap them up! If you haven't made a batch of this crazy addicting popcorn yet, you are really missing out! 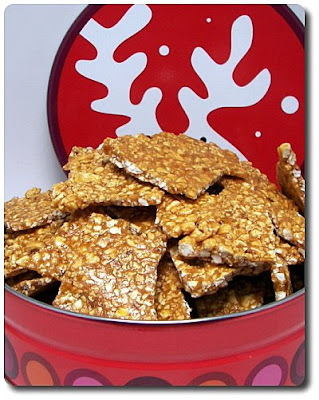 Heavy handed on the ginger, this crunchy snack is a must - period! Grown tired of your ordinary spiced nuts? 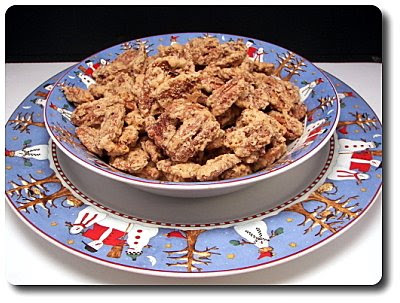 These sweet, roasted pecans, spiked with coffee liqueur and aromatic cinnamon, always seem to disappear at the blink of an eye! 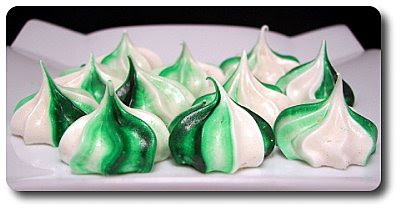 As always, we must do a few trays of these meringue cookies. Crisp and sweet, these light-as-air kisses are a guilt-free treat with a tempting peppermint tingle. For the stripes, just paint a line or two of gel food coloring inside the bag! 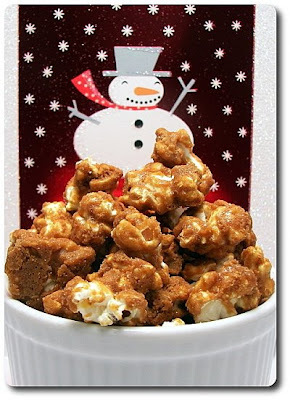 I know lots of people make brittle this time of the year, but can we lure you away from your favorite nut recipe to try out this unusual treat made with popcorn? Yes, that's right - popcorn! The special ingredient? Molasses! I do like to use brown rice syrup when making this as it is not quite as sweet, but light corn syrup would be fine to use. Do you like a spicy bite when it comes to food? 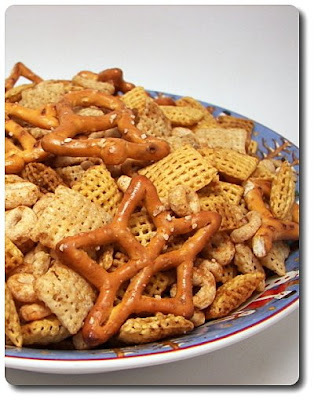 We worked that heat into a classic favorite snack mix - holiday-shaped pretzels and a few different kinds of cereal are tossed with a variety of savory ingredients, then baked to bring it to life! You can make marshmallows? Yes, you sure can! Jeff gets that question a lot when we bring them in to share with his co-workers. We tested these out a week or so ago first to see how well they did and when they got glowing reviews, we added them on to the list. This recipe makes marshmallows that are soft, luscious, and squishy with a definite note of peppermint! 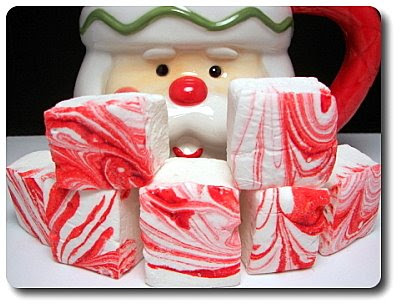 To make the design on top, all you need to do is scatter drops of red food coloring all over the top and use a wooden skewer to to swirl it into the stark marshmallows before they begin to set. Perfect to float atop a warm mug of your favorite hot chocolate. 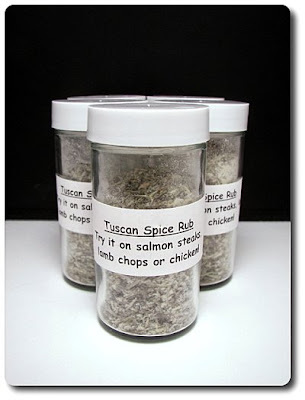 We thought it would be fun to include a homemade spice rub this year just to change things up in some of the packages. I settled on this one, which is a mixture of crushed fennel, basil, salt, garlic powder, rosemary and oregano. If you make this, add a few shakes to a few steaks of salmon, chicken thighs or even some lamb chops! 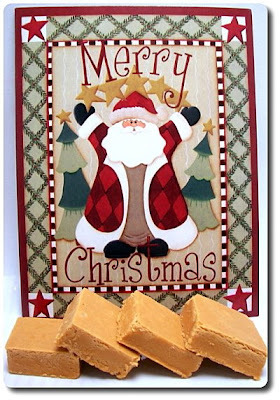 If you enjoy chocolate and love peanut butter with a passion, these smooth squares are for you! 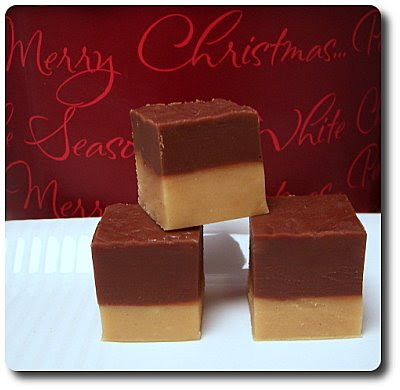 Rich, soft, yet can always be cut into clean squares, this fudge can't be missed! And we come to a close with these festive buttons that we started making about 6 years ago. 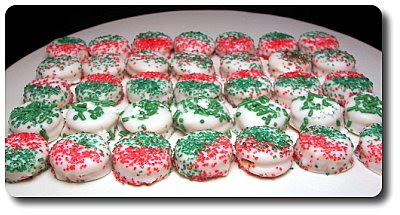 One-bite salty and sweet treats - these are small Ritz Bits crackers, filled with peanut butter, dipped into real white chocolate and finished off with a variety of holiday sprinkles. Okay... I think I need a nap - maybe for a few days! Hmm... what to do about tonight's dinner. I can't say that I was in love with this dish... and while Jeff and I did both finish our bowls, we were glad that we only made two servings worth of this Lamb, Fig and Olive Stew. This wasn't awful by any means, but for our tastes, there seemed to be a conflict in flavors that threw us off. Lean ground lamb can often be hard to find, so for the lamb in this dish, I used a piece of boneless leg that I got from our butcher that I trimmed the excess fat from, diced it into medium chunks and quickly pulsed it in our ever-useful food processor until it was coarsely ground. A little messy, but this process works well - I do the same thing when I need ground chicken or turkey - this way I can control what is in it and how much light or dark meat I want. Once we browned the crumbles, they were taken out, with a pungent dose of fresh minced garlic slid into the pan with a little oil. Also added was a fragrant pinch of herbes de Provence - you can buy this spice mixture pre-made, but I made my own by tossing together equal parts of marjoram, oregano, rosemary, savory and a pinch of dried lavender and crushed aniseed. The extra could be used for roasting meats, added to a favorite sauce or I've even used it before to season homemade crackers! The lavender is key - that alluring scent adds a such special note. At this point, we were good - what's not to like? To add a sharp background, and pull up those golden bits stuck on the bottom of the pan, we stirred in a splash of dry red wine. Beef broth, whisked with a little cornstarch, was next to be added to the spiced garlic. Chopped tomatoes, figs and olives were tossed in and the mixture was allowed to simmer, giving the cornstarch a chance to add body to this stew. The lamb was added back in to heat through and we served this stew topped with a gremolata - a basic condiment composed of fresh garlic, chopped parsley and bright lemon zest. We both enjoy the combo of sweet and salty, but the tomato, fig and olive combination just didn't sit well on our taste buds with the savoriness of the lamb. One of Jeff's complaints was he felt the lemon was more distracting than it should be - I didn't mind that so much, but I knew what he meant. 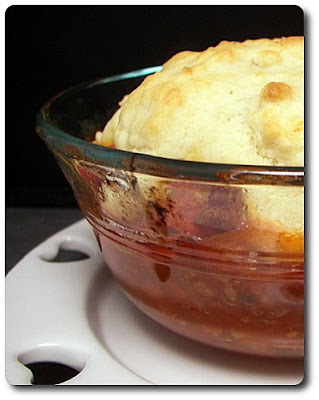 While I doubt we would make this again, if you've had those flavors mashed together before and you enjoyed them, you might like this stew! As we've talked about, we are in the middle of baking a bunch of Christmas items to send out, but I did manage to set aside some time to make a treat for us to snack on. Hopefully this will keep our grubby paws out of those goodies! 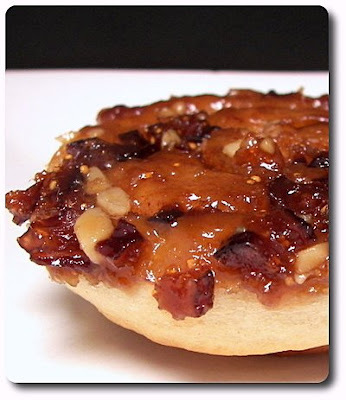 Jeff had been asking for some sort of sweet yeasted treat (hoping for cinnamon buns I think), but when I came across a recipe for these Fig-Walnut Sticky Buns and having an open container of dried Black Mission figs handy, I knew what I was going to try! You'll need to set aside a couple hours to complete this recipe, but most of that is down time while you wait for the soft, supple dough to rise. Once you've gotten your hands dirty kneading this nutmeg-laced dough, it is covered and set aside until it has doubled in size - you'll know when it has risen enough when you press a couple fingers into the dough and the indentations left behind don't fill back in. 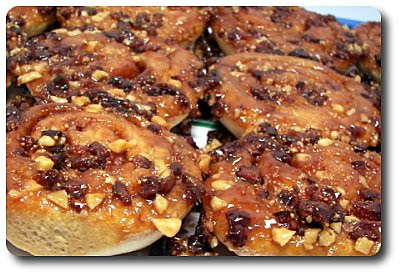 Close to the time it was done, a combination of brown sugar, Lyle's Golden Syrup and milk is brought just to a boil - the chopped figs are added, which will create the sticky topping as these buns bake. I used golden syrup because I am enamored by its dark burnt sugar/caramel notes, but if this doesn't strike your fancy or it isn't available, dark corn syrup would be the way to go. Right before we spooned this mixture in the baking pan, we sprinkled a handful of finely chopped walnuts over the bottom. When the dough has risen, we turned it out and let it rest for a few minutes - this short down time will make stretching it out into a rectangle a little easier. If at any point the dough starts to tug back at you and not want to behave, cover it and walk away for 5 or 10 minutes - the dough will take a deep breath, relax and give in to your hands. Brushed with melted butter, the dough is covered with brown sugar that we spiked with sweet-scented cinnamon. When you go to roll the dough up into a log, be sure to roll it tight and eliminate any air bubbles as you go along for a tight swirl. You can slice this a couple ways - use a serrated knife, or what I like even better, is unscented dental floss - I find with softer doughs the knife can end up squishing the roll while the floss glides right through for clean cuts. If you've never tried this method, slide the floss under the dough, crisscross the thread over the dough and pull the ends firmly to cut through. The buns are arranged over the gooey fig mixture in the baking pan - you don't need to snug these together, just space them evenly in the pan to give them room to grow. After another rise, these little guys are baked until the tops are a rich golden brown and the sugary bottom is hot. 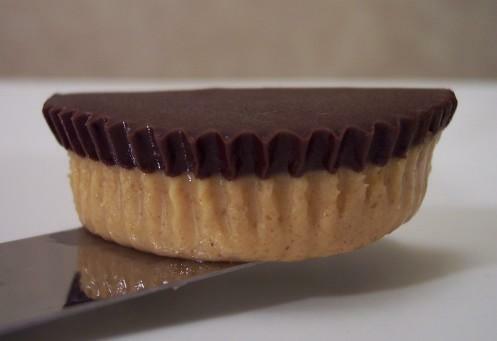 While you do want to cool them for just a couple minutes, don't wait too long to turn them out - invert them while the bottom is still quite warm so you don't loose the topping. While these might not be those humongous over-sized decadent buns you find in the malls, I have to say I appreciated the more delicate sweetness these reasonably portion-sized buns had. 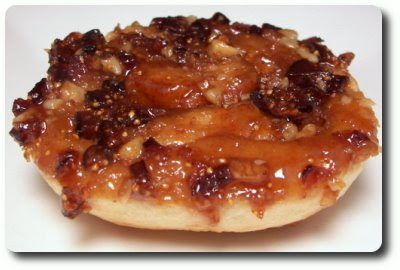 Jeff commented that the topping reminded him a lot of fig newtons, only a bit more nutty. These tender, sticky rolls will certainly keep us content and out of the holiday baked goods; however, I have a sneaking suspicion they will be gone way too soon (maybe because I've already had two...)! Eat your veggies... roasted style!